Remnants of a Roman statue in North Africa could be the "first-ever depiction of tartan", according to a BBC Scotland documentary. A piece of a bronze statue of the Emperor Caracalla contains the small figure of a Caledonian warrior wearing what appears to be tartan trews. The third century Roman emperor Caracalla styled himself as the conqueror of the Caledonians. A statue marking his achievements stood in the Moroccan city of Volubilis. It stood above a great archway in the ancient city, which lay in the south west of the Roman empire, 1,500 miles from Caledonia - modern day Scotland. A small piece of cloak from the monument still survives at the archaeological museum in Rabat in Morocco. "It includes an early depiction of that great national stereotype - the long-haired Caledonian warrior," says Dr Fraser Hunter, who presents the BBC Scotland programme. The warrior is wearing checked leggings which, according to Dr Hunter, is "the first-ever depiction of tartan". It is thought the Celts have been weaving plaid twills for thousands of years and this is the earliest representation. Dr Hunter adds: "The shield too is Celtic in style. You can see the warrior's head with the cloak over the shoulders. The arms are bound behind the back. "This guy is a captive. He's a prisoner from the vicious campaigns of Severus and Caracalla." Septimius Severus, Caracalla's father, led massive military campaigns into 3rd century Scotland. The mighty Roman legions had conquered all before them but they stuttered to a halt when they took on the tribes of Iron Age Scotland. Caracalla carried on his father's fight, waging a brutal campaign. Dr Hunter says prisoners could have been force-marched for months to other parts of the empire. "They were living trophies of the emperor's success. Some might have been traded as slaves in the great markets. Others would have been even less fortunate." Dr Hunter points to a mosaic from Tunisia which shows how one unfortunate Caledonian met his end. "Captured, marched for months to this desert province, sent to the amphitheatre and killed by wild animals as exotic entertainment for the locals," says Dr Hunter. 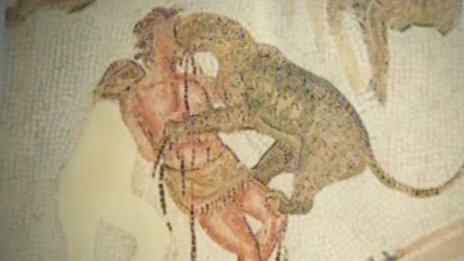 The expert says we have long had a curious "rather cuddly" relationship with the Romans. "In the western world we often see ourselves as inheritors of Roman values and Roman culture," he says. "But this evidence from North Africa reminds us that the Romans were invaders and colonisers. "Their strategies encompassed everything up to and including genocide. "For the local tribes the Roman arrival in what we call Scotland must have been absolutely terrifying."